The VZ range represented the final iteration of the vehicle platform introduced with the VT Commodore. It was distinguished by sharper design themes and a ‘twin spear’ sculpted bonnet, beneath which was a completely new high-feature Alloytec V6 engine. More powerful, responsive and fuel-efficient than the outgoing ECOTEC V6 and matched to new and improved transmissions, the Alloytec V6 reinforced Commodore’s reputation for driver’s car performance character and innovative safety technology. Chassis dynamics were improved by brake, suspension and steering system upgrades. All V8s now had electronic throttle control and improvements to engine management, transmission and cooling systems. SS and SV8 models had a power boost to 250kW. Strong graphics – larger air intake openings, new radiator grilles (with the single sports bar now shared by all models) – emphasised width across the front. 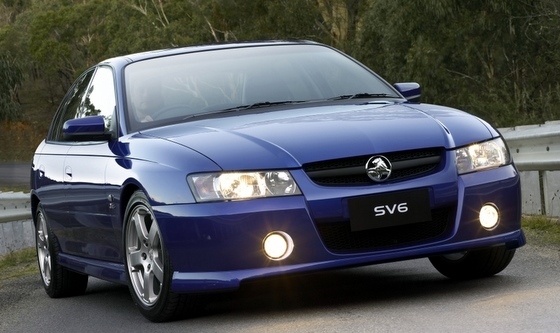 An SV6 performance model replaced the Commodore S. In early 2005, the SV8 took on SV6 exterior styling cues. The all-aluminium 3.6 litre Alloytec operated with double overhead cams and four valves per cylinder. It delivered more peak power and 90 per cent of peak torque between increased rev ranges, with fewer emissions. Executive, Acclaim and Berlina were specified with the 175kW Alloytec engine. The high-performance, 190kW Alloytec 190 engine specified on Calais and SV6 was linked to a premium five-speed automatic transmission with paddle shifters on the steering wheel. SV6 offered the option of a new six-speed manual. The Alloytec V6 introduced a new era in Holden chassis control systems and active safety technology, with Acclaim and Calais delivering features such as electronic stability program – a first for an Australian-built car – electronic brake distribution, brake assist and corner brake control, all of which help drivers to maintain vehicle control in emergency situations. Interior refinements included a new centre stack, which in Calais and Berlina had a insulated storage compartment for small items, fresh trim fabrics and patterns. Calais now offered leather trim as standard.